"The Most Space You Will Get in the Davisville Area!" Our large two bedroom suites are offered in two layouts and include privacy-glassed balconies or a patio area. 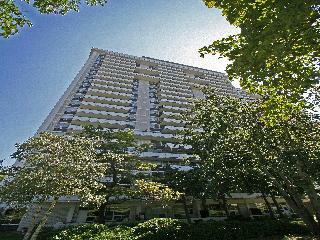 Both feature breathtaking views of either the Toronto skyline or our professionally landscaped grounds. All suites include a walk-in closet, plenty of counter/cabinet space and full-sized kitchen appliances. Both the kitchen and washroom are designed with ceramic tiles and contemporary fixtures. Each suite has been freshly painted in a modern monochromic palette and refinished parquet flooring. Welcome to 200 Balliol! Located in Toronto's prestigious midtown Davisville Village, 200 Balliol offers one of the neighbourhood’s largest green spaces for residents to use exclusively; to walk their pets or to enjoy some fresh air. The building also features beautiful, professional landscaping that enhances the building’s curb appeal. This exquisite property features a collection of newly updated suites coupled with an exceptional blend of luxuries. Each expansive apartment offers a balcony or fenced-in patio as well as large glass windows that flood the interiors with sunshine and impressive views of Toronto's renowned skyline. All designed and meticulously maintained for timeless appeal, our suites range from large and traditional to fully upgraded with hardwood and ceramic flooring, new kitchens, contemporary finishes and stainless steel appliances. With many amenities like our immaculate indoor salt water pool, a lounging deck and fitness centre. 200 Balliol's ample space also boasts brand new corridors and a modern renovated lobby. For the safety of our residents, 200 Balliol is equipped with state-of-the-art secured access, allowing only those with a designated electronic key to enter the building. Just minutes from Davisville subway station, 200 Balliol is steps from popular dining and shopping destinations. For the active-at-heart, the Kay Gardner Beltline Trail, Davisville Park, and Toronto Tennis City are within walking distance. Rent with Confidence - This building is CRB certified!